Try this quick, creamy and comforting vegetarian casserole with brown or basmati rice. Melt the butter and oil in a large pan. Add the onions, mushrooms, garlic purée, spices and wine and cook for 10 minutes. Stir in the tomato purée, stock and cream. Bring to the boil and then reduce the heat to a simmer. Add the parsley. 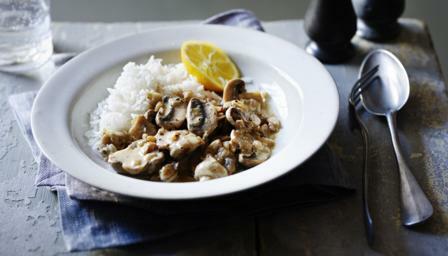 If the sauce is too thin, simmer the stroganoff until the volume of liquid has reduced to the desired consistency.